As a woodworker, I support and recommend the Makita SP6000J1 6½-Inch Plunge Circular Saw with Guide Rail because according to firsthand experience, you can depend on it heavily for years and years. It's been six years since I've bought my SP6000J1 and it's still working to this day. It isn't because I rarely use it either. It has seen plenty of action right off the box with my various woodworking projects, from making a cabinet out of spare wood to reinforcing the legs of a broken chair. I was even able to replace the structure on part of my door that's been destroyed due to moisture with the assistance of this plunge-cutting device. The Makita SP6000J1 cuts lumber such as plywood like a dream and leaves a beautiful cut edge when all is said and done. Thanks to its 12-amp motor and accurate cutting capabilities, it can cut large pieces easily. It also comes with electronic speed control to ensure the speed is consistently smooth on top of a speed dial that can go from 2,000 to 5,000 RPM. Excellent for plunge cuts.It has a large cut depth for a saw of its class. It won't replace your jobsite contractor saw. It doesn't cut pieces narrower than the track easily. What Benefits Should This Circular Saw Have? Before anything else, let's talk about what a circular saw is. A circular saw (as opposed to a band saw, jigsaw, or table saw) is a power tool saw that utilizes an abrasive or toothed disc/blade for the cutting of various materials using a rotary motion that spins around an arbor. The same motion can be seen from a ring and hole saw, but a circular saw is the one that's more disc-based on its cutting methods. The term can also refer to the blade used by the tool, which is indeed disc-like or circular in shape. These saws, as far as I've seen, is mostly used for cutting materials such as metal, plastic, masonry, and wood, but mostly wood since it's quite useful as a handheld device of sorts. Invented in the late 18th Century, sawmills back in the 19th Century commonly made use of these circular saws before they were modernized as power tools. Blades for these saws are precision engineered for every particular material they're used for, so your circular saw choice might be dependent on the kind of material it can saw apart of if its blades can be switched out with other blades or discs. 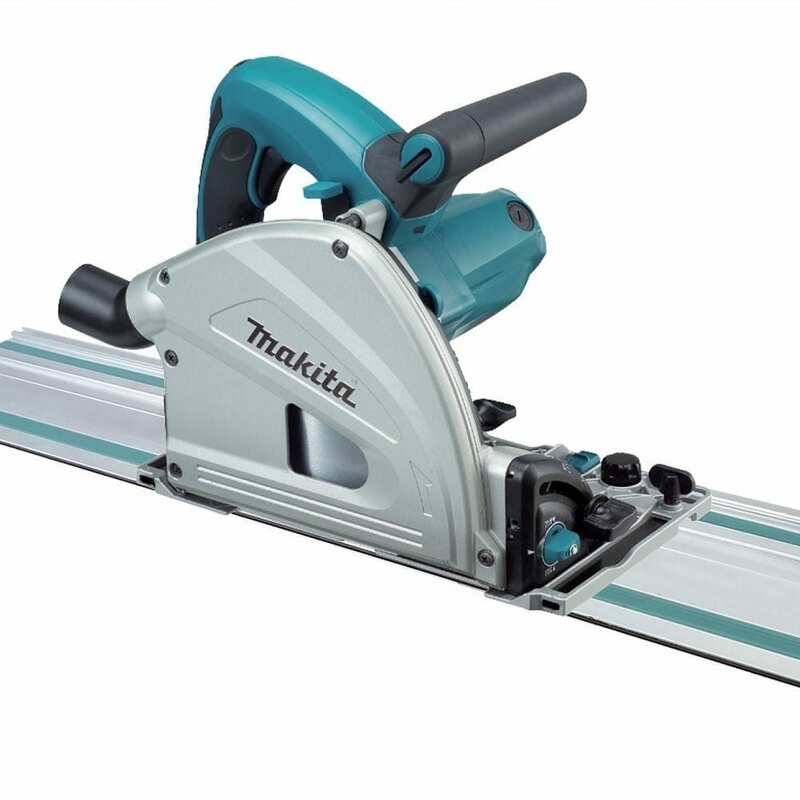 According to my research, the Makita SP6000J1 6½ -Inch Plunge Circular Saw with Guide Rail is mostly reserved for use by woodworkers first and foremost but not so much metal cutters because there are better saws out there (like table saws or band saws) when it comes to cutting down thick metal that won't wear down your circular saw's disc blade. It also gets a lot of action from the factory maintenance crew and construction workers. However, it's mostly used by them as a supplementary saw rather than a main saw because it mainly cuts large work pieces rather than smaller ones that a band saw can make short work out of. It's also not quite as powerful as the bigger portable saws out there when it comes to truly dense material. It's not supposed to be a replacement for your jobsite contractor saw. It's more of a woodworking and timber-cutting type of saw rather than a steel mill one even though it can cut certain types and thicknesses of metal. It's an excellent saw by light industry and DIY home improvement standards, especially when it comes to its assembly-line-perfect plunge cut that's useful for furniture creation. Here are the benefits a circular saw in general should have. Compare it carefully with the benefits that the Makita SP6000J1 has. There are table saw and portable saw variants of the circular saw. The latter involves slowly moving the material to be cut unto the fixed saw on the table. The former involves clamping the work piece with a vise or a clamp while the saw cuts through it. A good saw is capable of chipping the material tooth by tooth until the whole piece is cut the way you want it cut. A worthwhile circular saw investment should also possess a guide that allows you to chip out the work piece and prevent it from binding the blade or disk. For table saws, the guide is instead there to keep the cut straight as you move the material in and out of the saw. The guide is essential for precision cuts. The cuts from your saw should be relatively accurate and straight by having the teeth on the edge of the abrasive wheel or metal disc chip at the material at a fast rate until the cut is made. Aside from the smooth surface finish, a good circular saw should also provide a narrow kerf cut as well. With that in mind, here are the things you should take into consideration when buying a circular saw like the Makita SP6000J1. While a band saw can cut through anything within its cut depth and leave a clean cut afterwards, the same cannot be said when it comes to a circular saw cutting plastic or metal. When applying circular saws on these materials, address the burrs with the assistance of sand paper. A circular saw is not a jigsaw. While it is capable of plunge cuts that are perfect for home improvement purposes, it otherwise produces geometric straight cuts at different angles. In other words, it can't do clean curved cuts reliably and perhaps other saw types might be called for if you want curved cuts instead. The main materials that a portable or table version of the circular saw can easily cut to size are the following aforementioned pieces of lumber. Some models can even smaller pieces safely while other models are limited to cutting pieces of wood that can fit on their clamp or move through their table surface. Different models require different blade sizes. Among the blade diameters available are 6½ inches to 8¼ inches. The most popular by far is the 7¼ quarter inches models. Pick the blade size that makes most sense to you and your application. The third blade size is the more general-purpose choice of the three mentioned. The Makita 6-1/2” Plunge Cut Circular Saw and 55” Guide Rail SP6000J1 has been designed to reduce tear out and ensure more cut accuracy. This brand of saw claims to combine its motor and cut depth together in order to ensure smooth operation with no splinters or errors. The end result from this machine is a mirror finish every time. It's an ideal machine for workshop or jobsite usage. Cut Depth: 1 9/16" to 2 3/16"
Here are the features and benefits of note of the SP6000J1. By accessing this power tool's bevel capability of -1° to 48° with positive stops at 22.5° and 45°, you're allowed to experiment and widen your potential cuts. It's like how exploring the abilities of your phone enable you to discover some new feature about it every time. It's the same with the SP6000J1 and its control options. Just like every last brand of circular saw out there, the Makita SP6000J1 claims to make quality cuts that are free of splinters and imperfections from wood or mitigates burr formation on metal and plastic for easy sanding. The quality of these cuts is vouched by reviews and myself. It's made possible by the position of the blade entry (it goes on the same cutting line whether it's cutting bevel or straight). The saw features 11/16-inch close-to-wall cutting to further expand your cutting horizons. This depth stop is built-in and enables you to perform a-inch preliminary cut before the entire material is cut through cleanly and without splinters. This is perfect for making practice cuts, guide cuts, or plunge cuts. The machine has excellent dust collection for a track saw. However, I've found that taping the side hole closed is your best bet in getting the most out of the SP6000J1 in terms of cleaning up after itself. I know I've used by shop vacuum less often after I've done that simple improvement. A wide variety of materials can be cut by this machine thanks to the strength of its 12-amp motor. The accuracy or precision of the splinter-free cuts are assured by various precision settings and constant speed even under load. Aside from speed control for consistency, the power tool also has a speed control dial that goes from 2,000 to 5,200 RPM. Incapable of repeatable cuts like a table saw. Good for breaking down large pieces but not small ones. While the Makita SP6000J1 6-1/2-Inch Plunge Circular Saw with Guide Rail didn't get a perfect score, it still has a pretty high rating for good reason. Those who like the circular saw really loved it and were willing to write long essays about how durable and dependable the machine is, particularly its close-to-wall cutting feature that allows you to make your practice cuts or plunge cuts for the sake of creating joints for your furniture. Most of the negativity root from what I feel are unfair comparisons (that this model of circular saw can't replace a jobsite contractor saw or can't cut as deep as a bigger table saw or can't cut as smoothly as a band saw) or certain other saws performing a little better than this one (like saws capable of cutting wood materials big and small). The vast majority of positive reviewers raved about how the SP6000J1 makes assembly-line-consistent plunge cuts, ensures consistent speed to avoid splinters from the cuts, and how the torque limiter has saved them time and again from motor burnout while other cheaper models keep quitting on them. It even has an electric brake for good measure, which many of the reviewers (myself included) appreciated. Here are your potential alternative choices in case you feel that the SP6000J1 isn't up to your standards. To be quite frank, the DEWALT DCS391B outdoes the Makita SP6000J1 at almost every aspect except perhaps largeness (unless you're going for compactness and portability over cutting bigger pieces of lumber). This circular saw continues the proud legacy of the DEWALT (or DeWalt) brand when it comes to delivering robust power tools. The DCS391B features a 5,250 RPM motor (versus the SP6000J1's top speed of 5,000 RPM). It boasts of a high-strength, lightweight magnesium shoe that the Makita circular saw lacks as well as a 6½-inch carbide-tipped blade that works along the motor to produce powerful, silky smooth cuts with no splinters. The Makita however is more expensive because it can handle bigger lumber. As for the Bosch CS5, it epitomizes the 7¼ circular saw ideal size mentioned earlier (but it's not the only saw of that disc or saw size). It's one of the more common saws around among deck builders and woodworkers aside from the DeWalt brand. Its size and weight is closer to the Makita in a positive way (meaning it can take on bigger work pieces). However, its performance, cut depth, and motor specs are closer to the DEWALT example. It's a saw capable of handling hardwoods like garrapa, ipe, oak, and maple. It can do practically any kind of cut. It's particularly dependable at taking on compound miters and finger rips without its engine bogging down under load or its saw suffering from blade deflection. Here's another 7¼-incher that's able to make itself stand out with its single beam laser guide reminiscent of the LED light of band saws. Not many circular saws have this guide, but the SKIL 5280-01 15-Amp 7-1/4-Inch Circular Saw does. Long story short, its reviewers call it a powerful DIY circular saw that's amazingly lightweight. In fact, at 8.7 pounds, it's even lighter in weight than the Makita by 0.1 pounds (but it's not as small or lightweight as the DeWalt DCS391B). On to of its laser light to ensure cut accuracy, this power tool's weight has been significantly reduced from its older counterpart to reduce user fatigue. Furthermore, it even comes complete with a carrying bag for convenient storage and portability. The petit but impressively compact WORX WORXSAW WX429L (and other small circular saws like it) works under different standards compared to the bigger Bosch CS5 120-Volt 7-1/4-Inch Circular Saw and the Makita SP6000J1 6-1/2-Inch Plunge Circular Saw. This is a smaller hand saw with a smaller blade which assured less tool strain on the user. However, in exchange for that comfort is the fact that a, for example, 6½ inches to 7¼ inches circular saw can cover a lot more area and cut way deeper than its smaller counterpart, the 4½ inches saw. It weighs 50% less than a traditional 7¼ inches saw, but are you willing to cut things for a longer period of time in exchange of a lighter tool? If yes, then this is the saw for you. The Black & Decker BDECS300C is comparable to the SKIL 5280-01 thanks to the presence of the laser guide. It boasts of unique and standard features such as a lightweight design (WORX WORXSAW WX429L is still lighter by about 2 pounds), easy-to-use depth and bevel adjustments, spindle lock for straightforward blade changes, and the aforementioned laser light accuracy guide. Many of the reviews strangely pay a lot of attention to the laser guide, which is in contrast to the SKIL 5280-01 that also has a laser guide but has a lot more going for it as far as its reviewers are concerned. For my money, I liked the BDECS300C for being as light as the DEWALT DCS391B yet has enough room standard-sized 7¼ inches circular saw, which is high praise for Black & Decker craftsmanship. Yes, the Makita SP6000J1 6½-Inch Plunge Circular Saw with Guide Rail is at best a workshop cutting tool that excels at bevel and plunge cuts but is outdone by the likes of DEWALT and Bosch for different reasons. It's also true that it's no contractor saw for jobsite usage by construction workers and heavy-duty projects. However, you really shouldn't judge it by the standards of a contractor saw. Despite it not being as high-performance as the DEWALT DCS391B or Bosch CS5 or as lightweight as the SKIL 5280-01, WORX WORXSAW WX429L, Black & Decker BDECS300C, or (again) DEWALT DCS391B, it still delivers on quality cuts for your woodworking and home improvement needs as advertised by its manufacturers and vouched for by many of its owners. Nothing more, nothing less.